Enhanced Abilities: Shatterstar has enhanced strength, durability and endurance. 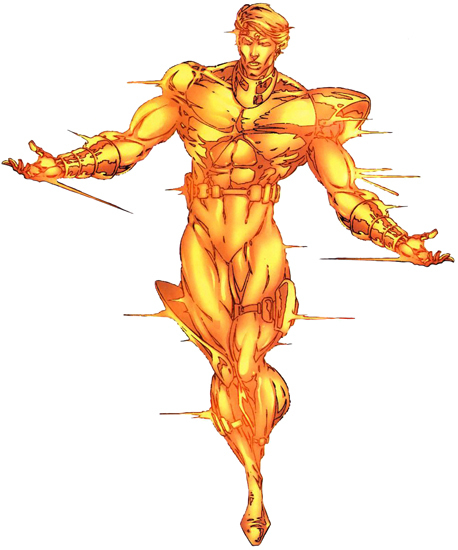 Body Transformation – Light: Shatterstar has become a being fully composed of "photo-mesonic" energy, Shatterstar is immune to many physical attacks, but is more vulnerable to energy bolts. In this form, Shatterstar only seems able to project heat, light, and concussive force. He can also fly at the speed of light andsurvive without eating or breathing. He is somewhat dependent on his headband (and presumably his wristbands as well) to maintain physical coherence. Light Generation: Originally, Shatterstar was charged with photo-mesonic energy, which he could focus through his wristbands in the form of various beams of light. Each colour of the spectrum had a different effect; his green beam was a stasis ray, his red beam was a heat ray, and his yellow beam was a powerful concussive ray. Body Armour Shatterstar originally wore battle armour that provided some protection from physical and energy attacks, as well as devices on his wrists that allowed him to better focus his energies. Flight: Shatterstar originally used a jet-pack to fly, he also travelled in a small starship armed with energy cannons. Arides was the son of two Kree scientists, Falzon and Murius, who specialized in photometric research. Shortly after his birth, Arides was selected by the Kree Supreme Intelligence to be used in the Personal Service Corps. Despite the protests of his parents, he was taken from them by force in order to process him for this service. Since Falzon and Murius were both experts in the conversion of light into energy they were given a new project to develop super-powered Kree soldiers using these photometric sciences. To their shock, they were reunited with their infant son, Arides, as he was to be their experimental prototype. His parents were unable to refuse experimenting on their son as he would have been killed right there in front of them had they chosen not to participate. Every day, for the first twenty years of his life, Arides was placed into a chamber where his parents focused concentrated photometric energies onto his growing body. At full maturity he was given a power suit attuned to his powers and he was given the code name Shatterstar. The Kree overseers approved of the outcome of the experimental treatments, though Murius and Falzon were disgusted at what they had turned their son into. Murius pleaded to her husband to take all three of them away from the Kree Homeworld and escape to Malador, a rustic planet where they could disappear and start over. She wanted a chance to give her son the nurturing he was denied for so long so that he would be more than just a killing machine for the Kree. Arides overheard his mother and father discussing their escape plan and instantly lashed out against them, condemning them as traitors. Though Arides had made quite clear his disgust for them both, his parents still loved their son too much to leave for Malador without him. Arides informed the overseers of his parents' plans to escape and, as Shatterstar, was placed in charge of their arrest. Only after his parents had learned of this betrayal to Kree command did they decided to try and escape on their own but it was too late. Shatterstar caught up with them at their spaceship before they could leave. Falzon surrendered immediately but Murius tried to run. Shatterstar shot his mother dead on the spot and then arrested his father who was put into a psychological rehabilitation program to reintroduce loyalty to the Kree Empire. Arides remained serving in the Personal Service Corps as Shatterstar.